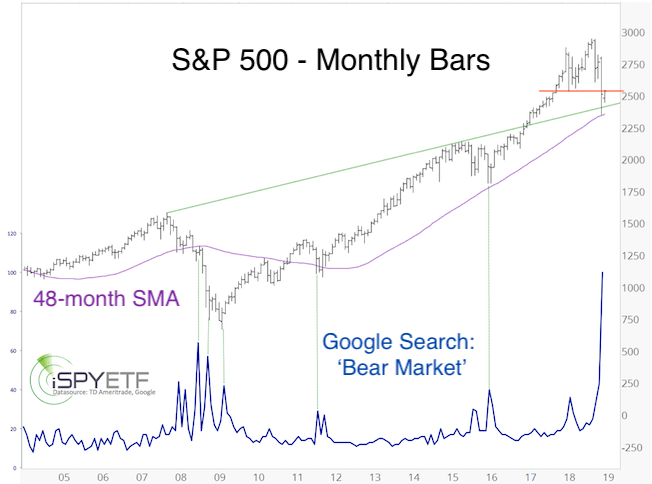 As the chart below shows, Google searches for ‘bear market’ also soared to an all-time high. “‘Bull market’ and ‘bear market’ is a status like ‘online’ or ‘offline.’ Just because someone is offline today, doesn’t mean they can’t be online tomorrow. As any momentary snapshot status, the bull/bear market status is not predictive of future events. Below is an updated version of the chart published in the December 19, PRR. 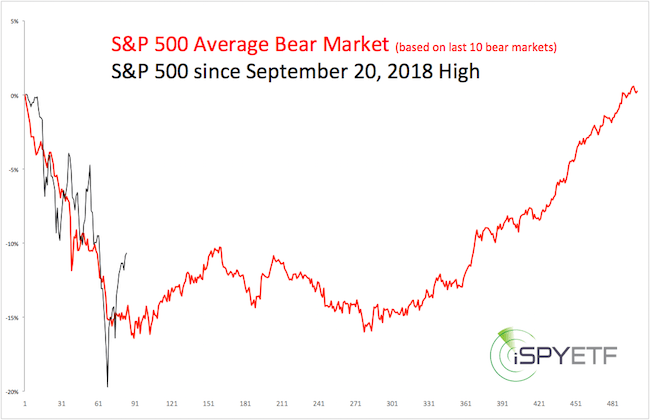 Even though the S&P overshot to the down side, and now to the up side, it is following the average bear market trajectory … if one considers this a bear market. Also note how the S&P bounced from support shown in the first chart. Is this Bear Market Already Over? On December 26, and January 4, 87% and 90% of NYSE-traded stocks advanced. Since 1985, there have been 5 other times when >85% of NYSE-traded stocks advanced within a 2-week period. Those 5 times are listed below. To the right of each date is a thumbnail chart, which shows how the S&P 500 performed over the next 6 month. In 1987, and 2016 the S&P retested the initial panic low. In 2009 and 2011, the S&P took off to the up side. The 2008 thrust was followed by a rally, but ultimately failed. 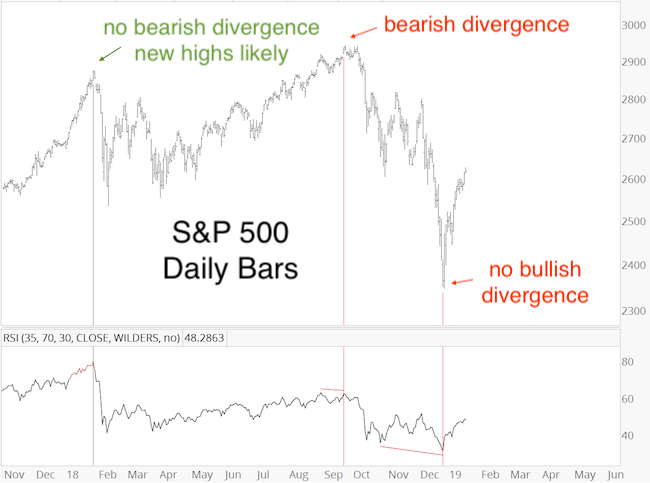 Divergences, bullish or bearish, are a helpful forecasting tool. Why? 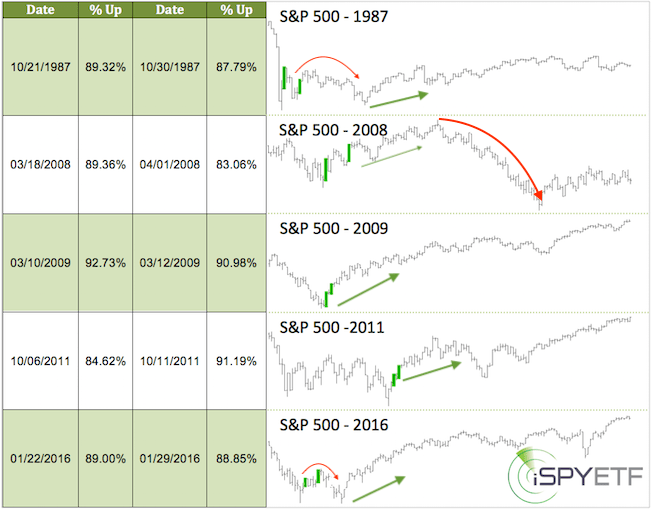 Prior to a major market turn, market internals tend to divergence from price. If there is no divergence, the odds of a major turn are lower. That’s what happened. But, there was a bearish divergence at the September 2018 high, which means new highs are no longer guaranteed. More importantly, there was no bullish divergence at the December low. This doesn’t mean stocks can’t reach new highs, but due to the bearish divergence at the September 2018 top and the lack of bullish divergence at the December 2018 bottom, the odds of new all-time highs are reduced. Unfortunately there is a conflict between two pretty reliable indicators/studies. The breadth thrust suggests new highs, while divergences (or lack thereof) suggest new lows. The S&P reached the black trend channel, which has been my up side target. The channel has acted as support/resistance numerous times over the past year, and may do so again. A re-test of previously broken support has ‘last kiss good bye’ potential. Unfortunately that matter is complicated by the fact that the popular 50-day SMA (blue line) coincides with the hand-crafted trend channel. The market likes to see-saw popular SMAs to fool the masses. 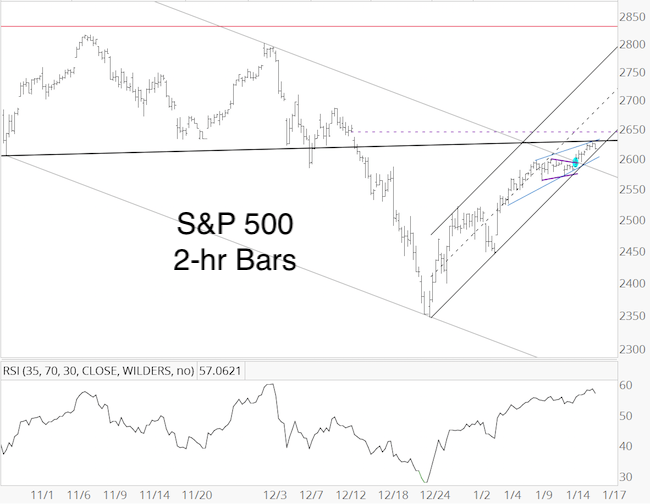 The 2-hour chart provides some more details: Yesterday, the S&P 500 broke above the gray trend channel (blue circle). While above that trend channel, trade may continue higher (note the potenial triangle outlined by the purple lines, or diagonal outlined by the blue lines). However, the larger black trend channel near 2,625 may end this rally leg (perhaps with some see-saw, courtesy of the 50-day SMA). A break back below the gray trend channel should usher in a 100+ point correction, possibly even a re-test or break of the December low. 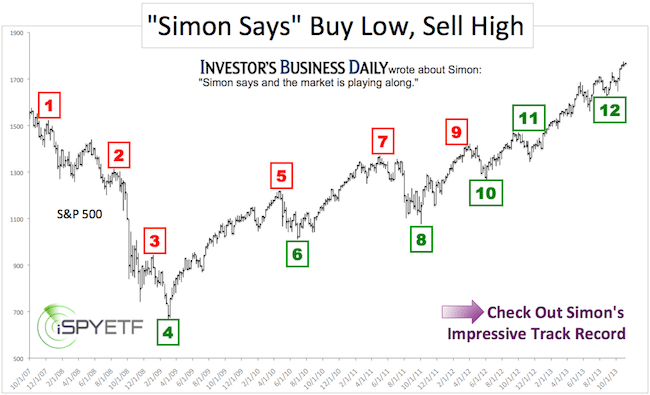 Follow Simon on Twitter @iSPYETF or sign up for the FREE iSPYETF e-Newsletter to get actionable ETF trade ideas delivered for free. Since their inception, the SPDR S&P 500 ETF has almost always confirmed new highs of its cousin, the Select Sector Financial ETF. The only time it didn’t was in 2007 … and today. Here’s what makes this potential repeat intriguing. For all the Whac-a-Mole bears who’ve been getting clobbered by the omnipresent bull market mallet, there’s finally a faint ray of hope flickering out of the same black hole that caused the last financial meltdown – the financial sector. True, the Financial Select Sector SPDR ETF (NYSEArca: XLF) is humming higher, but the SPDR S&P 500 Bank ETF (NYSEArca: KBE) is not. To be exact, the KBE bank ETF is trading 6.5% below its March high while the XLF financial ETF has already edged out new recovery highs. That’s unusual. Although we don’t need the aid of a chart to remind us of what happened post May 2007, the chart tells us anyway. Obviously, it would be premature to bunker up and batten down the hatches based on a sample size of one. Even if the 2007 scenario is playing out again, it’s too early to pencil in a market crash in your 2014 trading calendar. Why? There’s a grace period between the XLF high and the final S&P 500 (NYSEArca: SPY) high. In 2007, the S&P 500 rally continued five months after XLF topped and the market didn’t enter free fall territory until a year after XLFs all-time high. XLF just saw a technical breakout. This looks bullish on the chart until proven otherwise. However, the breakout mimics a prior pattern that failed (see “XLF Breaks above Resistance to New 6-year High” for more details). A small detail many have already forgotten is that the S&P 500 dropped nearly 12% in July/August 2007 just before shooting to its final October hurray. 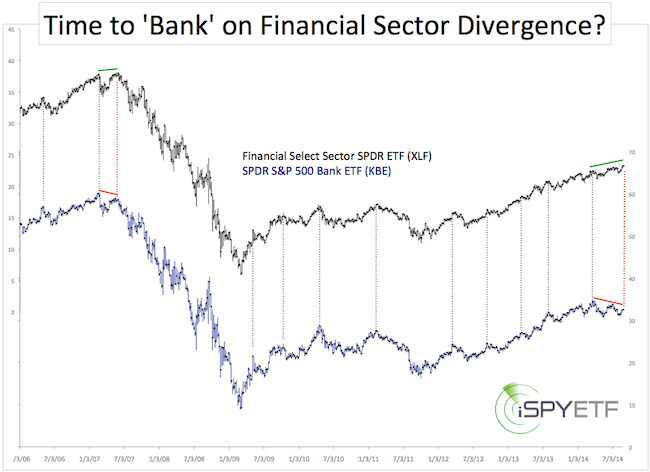 A similar pullback now would certainly make this financial sector divergence even more intriguing. Too Much Bubble Talk? Can a Watched Bubble Burst? If there were a contest for the most overused and loathed term in the financial universe, ‘bubble’ would be a serious contender. Not a week goes by without the media talking, writing, tweeting, or Facebooking some bubble warning. But can a watched bubble burst? A watched pot never boils. What about a ‘watched’ bubble, can it burst? In fact, there’s been so much talk that the chief bubble blower to be (Janet Yellen) took it upon herself to calm fears about the omnipresent bubble. Jim Cramer called it a ‘deceptive bubble,’ but a bubble is only deceptive if it’s unseen or illusionary. Based on a quick eyeball estimation, about half of all financial media outlets have spotted a stock market bubble sometime in the last week. The problem with real bubbles is that it takes hindsight to catch one. Bubbles aren’t caught, let alone predicted on live TV. If the stock market were currently in a bubble, it would be the first ever watched bubble to burst. I looked through my notes and found another recent period when bubble talk was popular – May 2013. 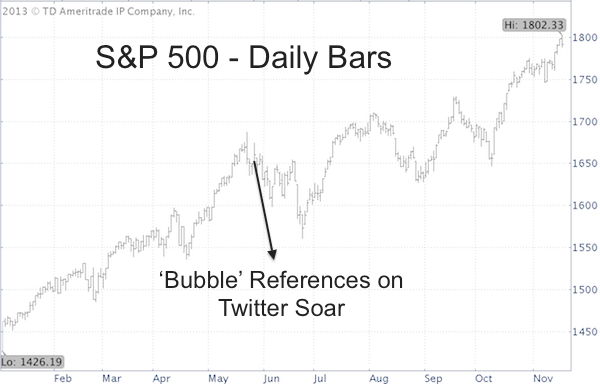 According to a MarketWatch article – ‘Bubble’ References on Twitter Soar – the volume of bubble-related tweets soared from 168 in late 2012 to almost 30,000 in April/May 2013. There was a brief correction that ultimately drove the S&P 500 ETF (NYSEArca: SPY) 8% lower. So, there was actually some truth to investors’ concerns, but instead of the expected post bubble storm there was no more than a tempest in the teapot. Obviously, this kind of financial media headline analysis is totally non-scientific and in itself doesn’t provide any actionable investment ideas. 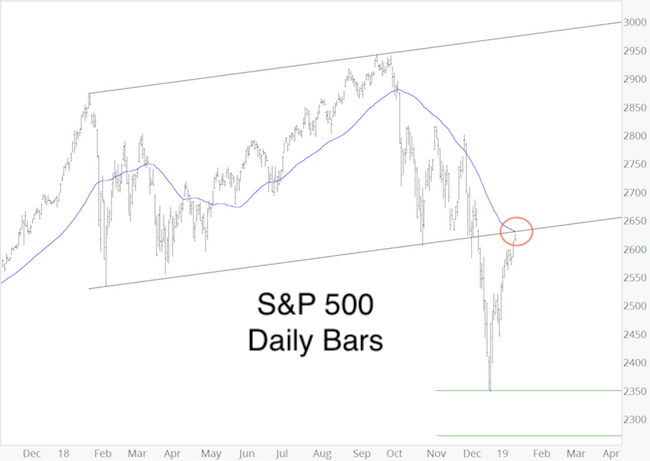 Here’s a detailed analysis of what the two divergence indicators say is next for the S&P 500 and broad stock market. Simon Maierhofer is the publisher of the Profit Radar Report. 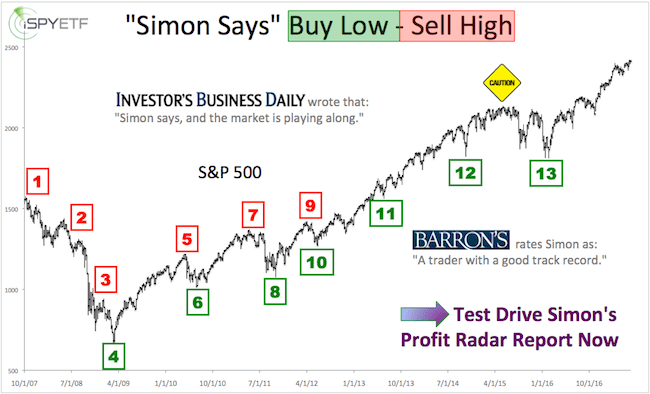 The Profit Radar Report uses technical analysis, dozens of investor sentiment gauges, seasonal patterns and a healthy portion of common sense to spot low-risk, high probability trades (see track record below). Follow Simon on Twitter @ iSPYETF or sign up for the iSPYETF Newsletter to get actionable ETF trade ideas delivered for free. Uncertainty is one of the annoying staples of investing, but there are times when risk and uncertainty can be reduced to an absolute minimum. The Financial Select Sector SPDR ETF (XLF) is at such a low-risk inflection point right now. Technical analysis is not infallible, but sometimes it allows you to pinpoint key inflection areas. The Financial Select Sector SPDR ETF (NYSEArca: XLF) is at such a key inflection point right now. 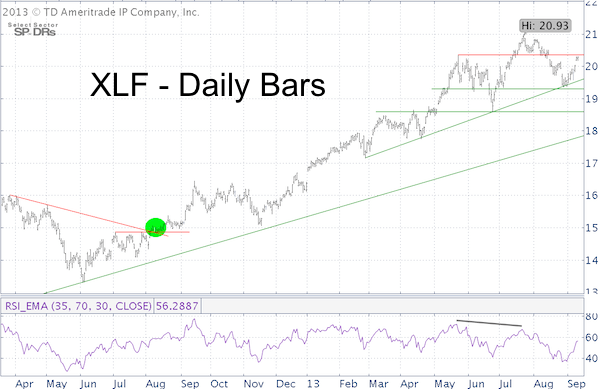 1) XLF is butting against resistance created by the May 22 high. 2) The rally from the August 28 low has almost exactly retraced a Fibonacci 61.8%. 3) The current rally high could almost be considered the right shoulder of a head-and shoulders top (although there’s no real neckline). 4) Key resistance is at 20.32 – 20.60. 5) Key support is at 19.50 and 19.30. 6) There is a bearish RSI divergence at the July 23 high. As long as trade stays below 20.60, odds favor lower prices ahead for XLF, potentially a sizeable decline. 2) Go short once support is broken. Those are low-risk trades, not no risk trades. Support/resistance levels act like traffic lights. A car driving down the street is most likely to stop (and reverse) at a traffic light. It doesn’t have to, but if the light is red it has to stop. Overhead XLF resistance provides a stop-loss level, which exactly defines the risk of the trade. The potential gain is significantly larger than the potential loss, putting the risk reward ratio in favor of the short trade. XLF echoes the current position of the S&P 500 (NYSEArca: SPY), which trades at a similar inflection point. The Nasdaq (Nasdaq: QQQ) has rallied much further than the S&P 500, the Dow Jones on the other hand (NYSEArca: DIA) has yet to catch up to the S&P 500. Regardless of the short-term outlook for XLF, the financial sector is still plagued by serious issues. Simon Maierhofer is the publisher of the Profit Radar Report. Follow Simon on Twitter or sign up for the Free Newsletter. Gold vs GDX – Is The Price Divergence Bullish or Bearish? The precious metals sector is one of the worst performers of the year with gold mining stocks losing three times as much as gold prices. Why did gold miners get hit so hard and can this be bullish going forward? Gold mining stocks represented by the Market Vectors Gold Miners ETF (GDX) have lost 35% since September last year. Over the same period of time gold prices have shed ‘only’ 13%. Is the GDX decline bullish for gold? In fact, the goal and business model of every mining company is to sell the most valuable asset on its balance sheet. It’s hard to create consistent value that way. Unlike brewers (think of your favorite beer) for example, miners don’t get any excess return from branding. It’s not that gold mined by Barrick Gold fetches more than gold mined by Newmont. Gold is gold and commodities are anonymous. Gold miners have enjoyed the best possible environment for mining and selling gold. Political and financial uncertainty have sent gold prices soaring from $250 to well over $1,500/oz, but Barrick Gold shares trade at their 1996 level today and shares of Newmont Mining (NEM) are at the same level as in 1987. Barrick Gold and Newmont Mining are well-managed companies. They are industry titans and combined account for over 20% of the Market Vectors Gold Miners ETF (GDX), but … mining just is a tough sector to create shareholder value in. The first chart illustrates gold miners’ struggle to keep up with gold prices. 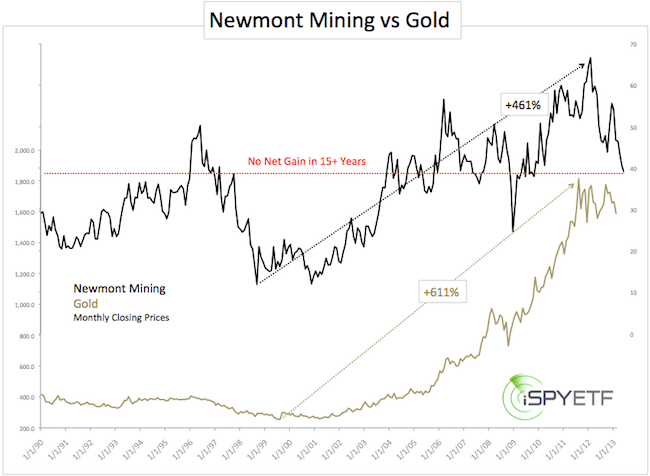 Newmont Mining is trading below its 1997 peak. Gold prices on the other hand have soared more than 600% since the early 1990s. Obviously, it is possible to make money with miners. From 1998 (or 2000) – 2011 Newmont Mining shares gained over 460%. However, it took a frenzy drop into the 1998 low and a frenzy rally to the 2011 high to deliver such handsome gains. The second chart below plots the percentage change of gold prices since the September 2011 high against the percentage change of GDX. Again, GDX has been hit much harder. Gold is down 17%, GDX lost 37%. 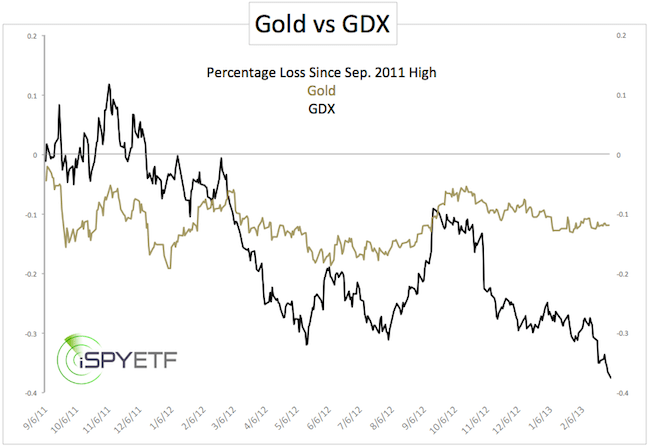 Is that performance discrepancy bullish or bearish for gold prices and GDX? Much of the damage has already been done and the recent drop no doubt spooked goldbugs. It also catapulted many fair weather gold ETF investors (SPDR Gold Shares – GLD and iShares Gold Trust – IAU) investors back to the sidelines. I would view a more deliberate test of gold support around 1,530 accompanied by a bullish RSI divergence as a buy signal (with a stop-loss below support).